well i better get paying that ten bucks since my yard is filling up with landlords, allis's, and now some old wards. I second that thought. Should be the best $10 you spent all year. Yeah,let's see that yard! Sounds like quite a collection. 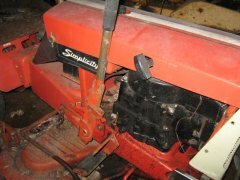 i have about 18-20 tractors around the place about half simplicitys, allis, wards, the other half are wheel horse's, and a few other models.